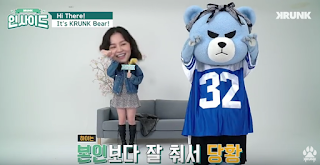 Lee Hi Told Krunk That She was Recording New Album These Day - KRUNK has been on Lee Hi MV `It`s Over` and dance cutely with Lee Hi. And for the first episode of Krunk Inside, Krunk invited Hi to Krunk`s channel. Krunk dance Hi`s song and cutely make it 2x faster. Then, Krunk gives Hi a cake without `Lee Hi I Love You` but gives Hi finger heart, makes Hi smiles by Krunk cuteness. Krunk invites Lee Hi to ask some question, the first question is `How are you these days?` and as YG said, Hi is busy working with her new album and she visited Japan yesterday. The second question is `What kind relationship do we have?` Before Hi answer Krunk question, Krunk gives Hi a bunch of flower wich mean `You are enough for me`, makes Hi thanked to Krunk.